From My Front Porch: I LOVE GIVING! I really do, especially when you think you have found the one gift that is going to make the recipient genuinely smile and warm their heart! My big thing on giving is to give what the person wants, something that reminds you of them - NOT something you think they should want! Basically I spent from January 1 thru December taking pictures of everything that we did - of course I took thousands (seriously thousands) of pics so then I had to sort thru them all and pick the ones I wanted to use - it ended up being 68 pages - I could of made it so much longer but practiced "some" restraint! The really neat thing about this was also that Chris knew I was making it for his Dad and he kept hinting how he would like a copy so my Mom surprised him with his own copy that he didn't know he was getting! For my MIL - I took pics of her 7 grandkids and framed the prints! For my parents I took pics of their 11 grandchildren made them a Shutterfly book of the pictures and then let my Mom choose her favorite then I had it printed on canvas to hang above their fireplace! Here is what it looks like hanging above her mantel! I had it printed at a place in Gunnison, Co - The Sign Guys and Gal - I have had several canvases printed by them and love their work and they are extremely reasonably priced! 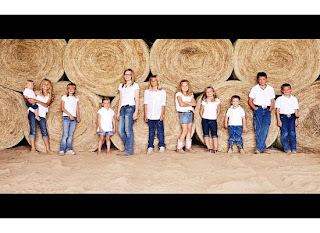 And no your eyes are not deceiving you - 7 of my Mom's grandkids are identical to all 7 of my MIL grandkids - remember we have that whole brother sister marry brother sister but it's all legal thing! That's a great photo over the mantel and a wonderful ideal. I might just have to do use that ideal one day. LOVE this! Have you ever been to Gunnison? Go there, enjoy an incredible meal at the Cattlemen's Club, then head due north to Crested Butte and just stay in what I think is the closest place to heaven for as long as you can. I sure miss my mountains out there. Your pictures are awesome and inspiring me to get mine out of my computer and out into the visual world! What an beautiful idea! 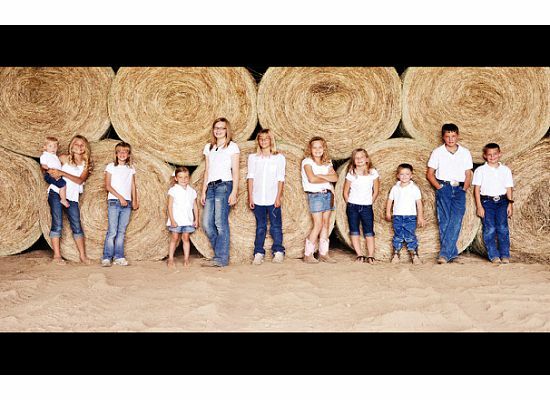 I absolutely love the group photo in front of the round bales. The real question is... how are you going to top this one next year?